Made this strange, almost alien looking loaf of bread this afternoon. This is my 3rd attempt on a Chocolate Marble Bread. I still finds it very tricky to roll out the dough without having the chocolate paste oozing out. I used the Hokkaido Milky Loaf recipe to make the bread dough as I need to use up some leftover whipping cream. I followed the rolling and folding method as shown here (I don't understand a single word in this wesbsite though) but instead of slicing the dough into short cylinders, I cut them into 4 long ones and stack them length wise, two on top and two below. I came across this shaping method when I was browsing some Chinese cookbooks at a bookstore yesterday. It's obvious that I didn't do a good job in rolling out the dough...they were in various sizes. I was quite certain that I wouldn't be able to get the nice swirls as the one in the cookbook. While I was preparing to make the chocolate paste, my little one offered his assistance. I had to decline as it involved mainly stirring the paste over the stove. He was very disappointed, but ran off to play on his own. His brother was down with a flu (again!) and was resting. When he saw me kneading the dough (I made the bread by hand), he came along and asked whether he could help me with it. Although I would rather not have him around while I am making bread, I simply couldn't say no, especially after I saw the great enthusiasm in his eyes. The dough rise, shaped, proofed and was finally baked. The entire process took about 4 hrs. Despite the ugly exterior, the cross section of the loaf didn't look too bad, although I must say, the swirls were not too distinctive. Once the bread was cooled off, my boy requested for a small piece to try. After the first bite, he asked for a whole slice. He ate it with great gusto...enjoying his fruit of labour! Place all dry ingredients into a mixing bowl. Mix the ingredients with hand. Make a well in the centre of the flour mixture. Pour the lightly beaten egg, milk and whipping cream into the well. 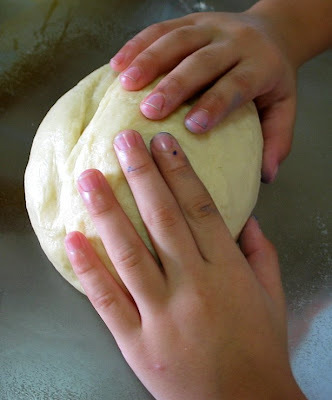 Mix the ingredients to form a soft dough. Turn out the dough onto a lightly floured work surface. Knead for about 15 ~ 20mins until the dough becomes smooth, elastic and non-sticky. Remove dough and punch out the gas. Turn the dough onto a lightly floured work surface. Roll out the dough into a rectangle (about 45cm x 20cm). Place the chocolate sheet on the middle of the dough. Wrap both ends of the dough over to cover the chocolate sheet completely. Take note that the dough should be rolled long enough for both sides to fold over the chocolate sheet. Seal the edges tightly. The dough should now be about 15cm x 20cm. Roll dough from centre to the edges to form a long rectangle (about 45cm x 20cm). Do this gently to prevent the chocolate paste from oozing out. Fold the dough into 3 folds. Finally, roll dough to about 40cm x 18cm. Cut into 4 individual rectangles (each about 10cm x 18cm). Note that the 18cm length is the length of my loaf tin, you may adjust according to the length of your pan. Roll up the each dough tightly, swiss-roll style, to form a roll with a length of 18cm. 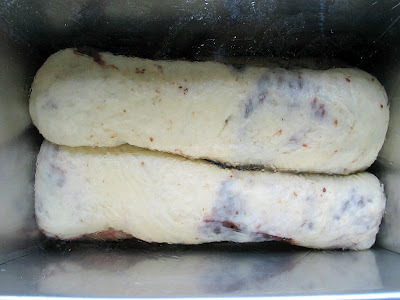 Place two dough (length wise) in a lightly greased loaf pan and stack on the other two rolls. Let proof for another 1 hour or until the dough rise to about 80% of the loaf pan. Cover with the lid (for a pullman tin). Preheat oven to 200 degC but bake at 180 degC for about 35- 40 minutes. Remove from oven and unmould immediately. Let the loaf cool off before slicing. This has to be the most interesting bread recipe ever. I can't wait to try it... I'm intrigued! I think your boy got potential in baking leh. Look at the way he knead the dough.I am trying out your Hokkaido Milk Loaf recipe today. Hopefully, my first attempt on bread making works. Just beautiful. 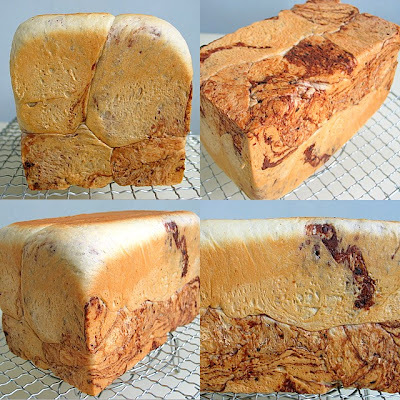 I never heard of marbled chocolate loaf bread, but you have intrigued me. I think your boy can knead better than me. He's very good! I hope I can read japanese. The website looks very interesting. interesting receipe. somewhat like the chocolate bread sold by four leaves. for point 7, do u mean u hv 4 swiss rolls? fm 4 become 2 ? Love the stuff you keep baking. I'm still a novice at this. Love chocolate and bread but am not sure how they would taste together. Your chocolate bread looks lovely, though. Sue Sue, I hope you will like the Hokkaido Milk loaf! All the best! Gigi, I think this is originated from Japan, we can get these kind of bread from certain bakery shops here. Smal Small Baker, his hands are too small for the dough :) I can't read Japanese either. Even if I use babel fish to translate it...they don't make any sense to me. Do look around the website as there are a few vidoe clips on shaping a dough. Yan, being a baker will be the last time on his list. He's now 'preparing' himself to become a detective! Ok, you will need to make 4 long rolls. Place two rolls in the tin, then the other two rolls stack them on top. So you will have 4 rolls in the tin. Hope I am clear? It's kind of difficult to explain all these in words! and I didnt manage to take any photos when I was shaping the dough. Hi Aparna, I consider myself a novice too! Just that I have got more time on hand to experiment and practise. Chocolate with bread is nice!! Yes, that's right, just stack the 4rolls, 2 on top 2 below. Hi! Yeah yet another post from you! :) Is this recipe only for loaf breads? Can I use this same recipe to bake individual buns and put fillings in? 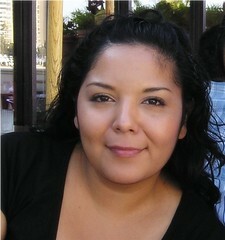 i really am addicted to your blog!! and your boy, i think he is so cool! his kneading looks very professional! I'm not joking! this loaf sure gives me some good ideas on what to do next! Yr boy really got potential! And so much energy for someone so small!!! Very cute hands! Thanks for all the wonderful recipes and step-by-step guide! They are really great for beginners like me! I have just tried your bread recipe. I wanted to use my bread machine since I have not used it for a while. When I put everything in, it didn't work and I had to slowly take out the ingredients and your recipe for those w/o a bread machine came in super handy! =) As I was rushing out, I didn't let it proof for 45 mins during the second proofing and the bread came out a little flat but still ok. Thanks! Will come back for more recipes! Thanks for being an inspiration! I've started a new blog to keep a record of my bake attempts. I know what went wrong with the charlotte cake, I forgot to line the base with finger sponge, duh! Anyway, I will definitely try again. One question tho, the foil was stuck to the finger sponge, how to prevent that? The loaf looks beautiful to me leh... definately not ugly... you did a great job! 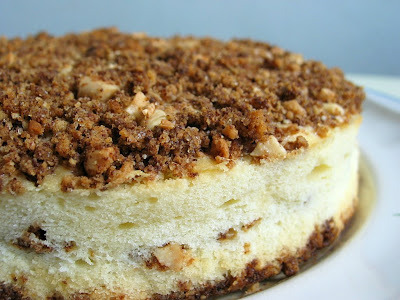 I am a beginner too at baking, thanks for sharing the recipes and pics. By the way, you've been tagged! Check my blog for your award. Hi vb, he's very tiny, as compared to other kids in his class! but he has got lots of energy!! Adeline, I don't remember having problem with the foil...are you refering to the sponge fingers at the sides? or the bottom? If you have a springform pan, or a pan with a removable bottom, you need not line your pan with foil. Hi Ida, thanks for the encouragements! 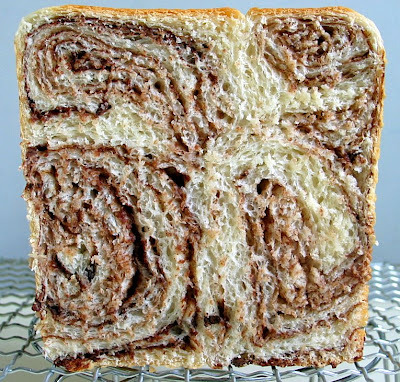 You were the one who inspired me to bake this chocolate marble bread! Aimei, I'll love to read about it! That Hokkaido Bread recipe is indeed a very good one. I tried it last year and I love it. BTW, I pass you an award.